With the release of macOS 10.13 High Sierra, Apple updated the Photos application to version 3. Some of us would still not be happy with Apple for ditching iPhotos and Aperture in earlier operating systems, but the editing tools offered by Photos are so well thought for beginners and hobbyists. -Syncing of people albums across iCloud. -Third party photo editor support such as Luminar and Pixelmator Pro. -Adobe Sensei (Artifical Intelligence similar to what Apple and Google has implemented). -No way to add GPS data. -No history in Develop module. Apple's cloud data pricing is extremely generous as compared to Adobe's. $9.99 for 2TB of iCloud storage vs 9.99 for 1TB with Adobe Lightroom CC subscription(not to be confused with Adobe 9.99 photography plan). For users who are already paying for iCloud, it is not an easy task to convince them to use another cloud-based photo service. These premium users already have the ability to view/edit photos across any of their devices with iCloud photos. If you don't need substantial editing capabilities for your photos and syncing edits with Classic version, by all means, I will highly suggest the convenience and better speed of Apple photos. 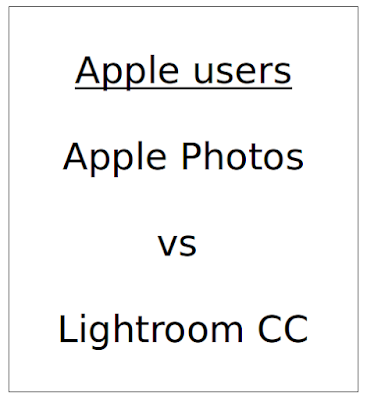 In case you already have the Adobe photography plan, there is no harm or disadvantage in trying the Adobe Lightroom CC by yourself as it comes as a part of the same plan but with limited cloud storage. If you found this post helpful, share the photography love by sharing this post.